The Uphill Trust Chairman Niall ‘Max’ Macdonald, attended Dollar Academy in the 1960s and early 70s then went on to the University of St. Andrews were he met trustee H E ‘Liddy’ Semmens, and, three years later, his wife trustee Belinda Macdonald (nee Drake). A couple of decades and several continents later, the Macdonalds returned to Dollar so that their sons, trustees Shaun and Calum Macdonald could attend Dollar Academy in their turn. At this point they became friends with committee member Alison Irvine Smith, also a former pupil of Dollar Academy. Alison and Liddy formed a new friendship when they joined Max and Belinda on a trip to Uganda in February 2015. Max, seen here with the School Director Elius, has been an Airline Pilot for 25 years — the past 20 with British Airways, on a variety of fleets. 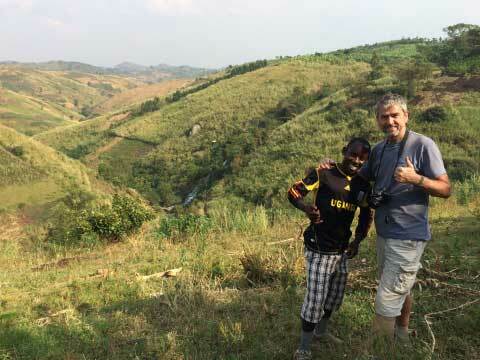 Max flew Boeing 767s into (and out of) Entebbe, Uganda, every few weeks until the end of 2015 and drove out west to Fort Portal up to 6 times a year. The rest of his working life was spent flying between the UK and the USA, Bahamas, Canada, Kazakhstan, Russia, Europe, or anywhere else that British Airways sends him. Previously Max has flown small planes around the southern United States and driven taxis around the capital of Australia. Max is the Strategic Thinker of The Uphill Trust, and Chief Liaison Officer in a country where man-to-man talk still rules much of the decision making. His ability to talk to anyone, anywhere is a valuable asset to the Trust. Update: Max retired from BA in June 2017 but he still makes self-funded visits to Uganda twice a year to check on developments at the school. Belinda (sitting on the Equator) is the career-change queen of the Uphill Trust Management Committee. After an initial degree in Anatomy and Experimental Pathology at the University of St. Andrews and a PhD at the Australian National University she worked as a Research Scientist, Independent Financial Adviser, Further Education Lecturer, School Governor and Educational Sales Consultant before retraining once again, this time as a Garden Designer. She has been running Shades of Green Garden Design, since 2007 and now juggles garden masterplans and planting recommendations with the general and financial administration of The Uphill Trust. Liddy (propping up the right-hand side of the Equator circle) moved on from her initial degree in Anatomy and Experimental Pathology at the University of St Andrews to the University of Dundee, where she qualified as a Dental Surgeon in 1983. She has been working as a Dentist in Dundee ever since and has been running her own dental practice since 2010. When not examining teeth or dealing with the administration of a busy practice, she sings with two local choirs, and runs the 1st Newport Brownie pack. Liddy is the Health and Sanitation expert on the Uphill Trust Management Committee and, with the help of the Brownies and her network of patients and friends, is a star fundraiser. 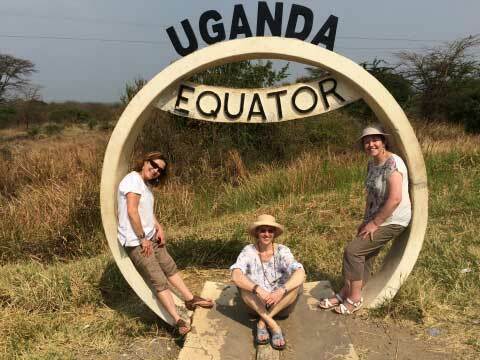 Alison (on the left side of the Ugandan Equator) has been co-opted onto The Uphill Trust Management Committee to provide legal advice and fundraising support. 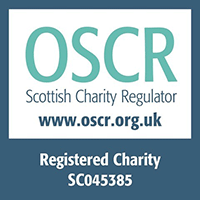 She gained a Bachelor of Laws degree from Strathclyde University in 1983 and qualified as a solicitor in 1986. She followed that up with a Master of Laws degree in 2008. Alison currently works as a part-time legal administrative assistant and when not up to her ears in legal paperwork she can be found on the curling rink, on a yacht on the high seas, stomping around the local hills with a dog, on a ferry to the Isle of Bute, or feeding the five thousand at a range of family and other social occasions. Shaun and Calum are Max and Belinda’s young adult sons. 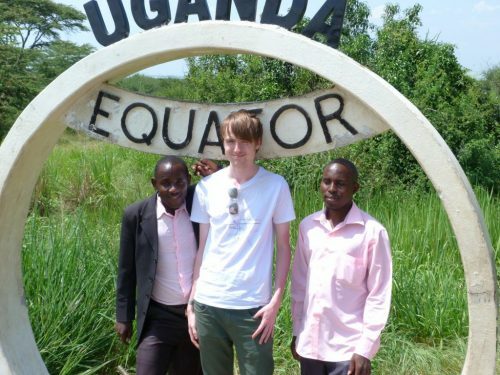 Shaun (seen above with the Uphill Junior School founders) graduated from the University of Glagow with a BSc Hons in Computer Science in 2018 and is now studying for a PhD in the same field. He is responsible for the Uphill Trust video collection and provides advice on ‘all things digital’. 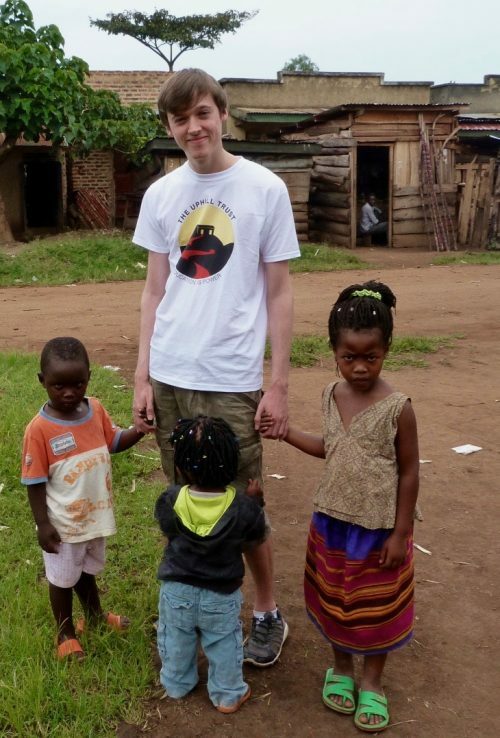 Calum (above, with some of the younger children in Iruhuura) graduated with a bachelor’s degree in Accounting and Financial Management (University of Glasgow, 2017) and is now working in the Accounts department of an e-gaming company and studying for Chartered Accountant status. His financial expertise is a valuable addition to the trustee team. Both visited Uphill in 2015 and are looking forward to another trip to Uganda when their busy lives will allow.